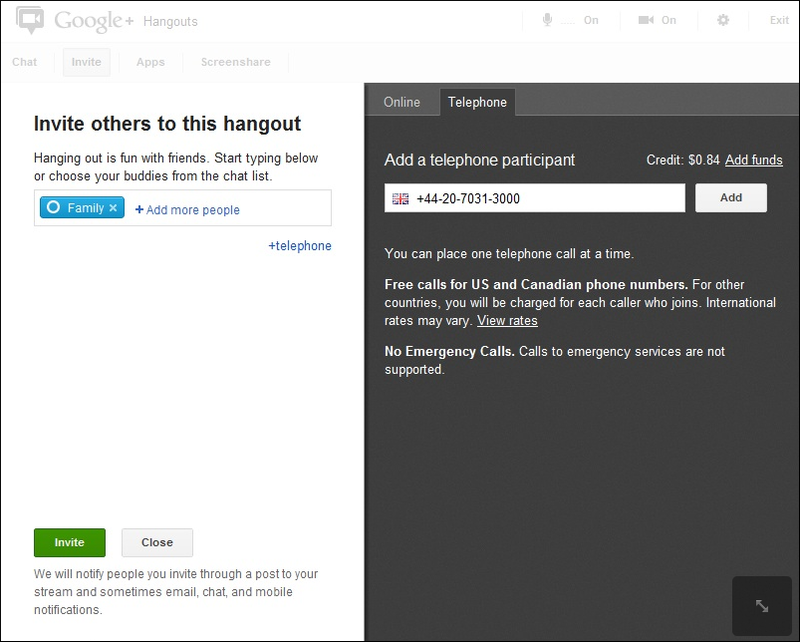 The feature is limited to outbound calls and cannot accept incoming calls to your Google+ account. It's also currently desktop-only, and isn't compatible with Google+ on mobile apps. Calls to phone numbers in the U.S. and Canada are free, and callers can buy credit to dial out to international lines. To place a call, click the "Invite" button in Hangouts, then the "+telephone" link. After entering the number, hit "add." The dialer currently stores one number at a time. The Google Voice platform powers the entire operation, though the feature bears the Google+ Hangouts name. You can similarly place calls to land lines and mobile phones using Google Voice's integration into Gmail.